Controls Wii Remote: Use the Pointer to move scissors left and right. Cut from the Team is a Battle minigame in Mario Party 8. Its name is from the expression "cut from the team", which is when someone is removed from a team. 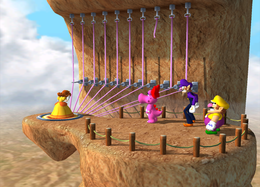 The four players find themselves on a mountain, with a little stand and ten wires connected to it. This is a luck-based minigame. There are ten wires, of which three are live wires, and seven are dead. The players will go one by one on to the stand, snipping one wire at time. Once they cut it, they will duck. If the wire is dead, they are safe and they will go back to the end of the line. If the wire is live, they will be shot off from the platform, and the game will continue with the rest. Once three of them are gone, the last one remaining is the winner. The winner will do his or her victory pose while the screen slowly zooms out. Rules – "Take turns snipping wires. Some are dead wires, but others trigger a catapult that sends you flying." Hint – "It's all luck here! Cross your fingers." This page was last edited on April 22, 2018, at 16:58.